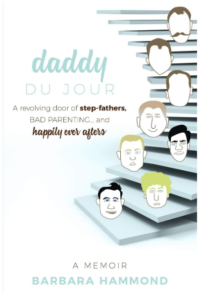 daddy duJour is a book about survival in many ways. Barbara became the primary caregiver of her younger brothers at an early age. There was a revolving door of men in her mother’s life. Some were good; some were not. Her favorite stepfather introduced her to the man she’s been married to for more than 50 years which proves how living in chaos can sometimes lead you to the other side. That’s a happy ending. You can follow Barbara on Facebook. Tell us about Barbara Hammond. Where you live? Career? My husband Dave and I live in Cape May, NJ. We have moved all over the North East Coast due to Dave’s career in retail. He is now retired. We have 2 sons and 3 grandsons. I used to say, “We couldn’t buy a girl in our family.” Then my son asked me not to say that anymore because his youngest asked if they could buy a girl. I think he wanted to trade in his big brother for her. With all the transfer moves we had, I would reinvent myself. I worked for a modeling agency in the Philadelphia area back in the ‘70’s. Several years later we moved to New England, and I opened my own talent agency. When we returned to Philly, I took my old job back and expanded their talent agency. I’ve worked in Newspaper and Radio advertising sales in Pittsburgh, Philadelphia, Wilmington, and New England. Art has been my hobby since high school. I’ve been successful in selling some of it over the years. I still accept pet portrait work. It’s relaxing for me. This book is so personal. Why did you want to write and share your experiences? I started blogging 9 years ago. 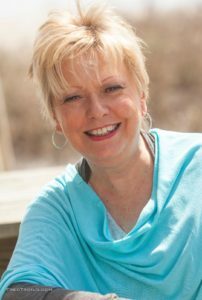 As the blog Zero to 60 and beyond began to grow, I started sharing some of my childhood stories, and they received many responses. I think it helped others feel okay about sharing their own stories too. Several readers kept asking me when I was going to write my memoir. I had started it about twenty years ago but I couldn’t get through it. A lot of the pain was still lingering, and it would depress me. But this past year I realized how fortunate I am to have been married to my best friend for 50+ years (which I always add, “Ten years of wedded bliss, not necessarily consecutive.”). I felt it was a story of survival and others might get something out of it too. Writing this book is a combination of purging and freeing myself from all of that darkness. It’s been freeing for sure. What do you hope readers take away from this memoir? I imagine there will be many different things that people may get from reading my book. If they’ve survived abuse, I hope they can find peace in knowing they are heroes. If they are going through any sort of abuse—physical or mental from parents or spouses—I hope they will find strength from my story to help them overcome it and move on. What were the challenges or struggles in writing this work? The greatest challenge was reliving my past. You can’t write about these things without having it running in technicolor through your head. I started and stopped so many times over twenty years! Finally, it’s done. I feel lighter! You are an artist as well. What kind of art do you do? What other writing projects do you have in mind? I am currently working on the second children’s book of The Duffy Chronicles. This is about our special boy Cosmo. Ironically, he was kind of abused as a puppy by a family that should have been more compassionate but were just too busy with work and children to realize what they were doing to the poor dog. He spent three-quarters of the day in a crate. I do the illustrations too. I like the interview and am going to buy the book. Congrats on approaching your life’s past through memoir and adding a smile and a laugh as you go. CONGRATULATIONS BARBARA – I just bought my copy and I cannot wait to dig in!